With a character as rich and diverse as its terrain, Lake Garda has been a long standing favourite of Inghams guests and for good reason. With its vineyards nestled high in the surrounding verdant mountains, lemon and olive trees lining the streets and chocolate box harbour towns perched delicately on the lakefront, Lago di Garda is a cultural culmination of not just northern and southern Italy but also neighbouring Austria. With azure waters akin to the Ligurian Riviera, imposing baroque architecture similar to that of Puglia's alabaster coastline or the grand towers of Firenze and charming cobbled lanes not unlike the shopping districts of Western Sicily, Lake Garda puts its own historical spin on Italy as we know it. With this in mind, it is not difficult to picture the many poets, writers and actors who have made Lake Garda their home over the years, including the likes of Maria Callas, James Joyce and Tennyson who was known to spend his summers in Sirmione enjoying a lemoncello on the lakefront. Each resort boasts its own exports making a boat trip around the lake akin to a world tour as you enjoy the sweetest lemoncello in Limone, the sharp and rich flavour of Gran Padana cheese in Desenzano and the succulent olives of Riva as well as the rich and velvety oil that comes from them. The southern shores of Lake Garda boast stunning man made beaches resting on a low terrain with gentle sloping hills home to pine forests and some of the more modern architecture in the region whereas the north boasts a much more rugged terrain with jagged rock faces and impressive cliffs descending into the sometimes blustery waters which makes the nothern resorts of Malcesine and Riva well known for water sports and annual regattas. The year round temperate climate is one of Lake Garda's most unique charms with fresh mountain air and glorious sunshine meeting to create a warmth which envelopes the entire lake and gives life to fruit trees for nearly the full twelve months of the year. The diversity between every resort on the lake means there is certainly no shortage of things to do and see from the art galleries and fashion fairs of Riva, the food tours of Limone and Sirmione, water sports of Riva and castles and Roman remains of Malcesine, there is something for everyone to enjoy. Bardolino sits at the south of Lake Garda surrounded by green countryside of vineyards and orchards. The long promenade stretches along the lakefront and is filled with restaurants offering al fresco dining. This lively town is at the south of the lake and has a lovely mix of lakeside bars, shops and beaches. It’s well-connected to other towns on the lake and its train station makes for easy day trips to nearby cities like Verona. Garda boasts winding alleyways and characteristic palazzos giving it a charming atmosphere. The wide lakeside promenade makes it a popular choice with walkers and cyclists. Gardone Riviera is one of the main bays on the west coast of Lake Garda and consists of two elegant resorts; Salò and Gardone. Sheltered by the lakeside hills, its mild climate has long attracted visitors who want to relax and regenerate. Limone clings to the rocks on the northern shores of Lake Garda with dramatic lake views from its vibrant promenade. The narrow lanes that run through the village hide authentic restaurants and there’s plenty of walking opportunities too, with paths leading up into the mountains. Considered to be one of Lake Garda’s most beautiful towns, Malcesine has atmospheric cobbled streets, upmarket boutiques and a 13th Century castle that sits at the top of the town with some of the best lake views. Peschiera is situated where Lake Garda’s waters flow southwards to form the River Mincio. Striking medieval walls fortify the river borders of the Old Town. Peschiera’s focal point is the delightful pedestrianised centre with bustling streets full of all kinds of shops, churches and riverside cafés. Lake Garda’s northernmost town enjoys dramatic mountain landscapes and an atmospheric piazza. Sit back with a coffee in one of the lakeside cafés and watch the windsurfers that travel here for the fantastic conditions. Salo, a lovely Belle Epoque town full of handsome cafes, townhouses and hotels, many the result of rebuilding in the prevailing liberty (Italian Art Deco) style after a 1901 earthquake. Its history dates back to the Romans and Venetians. With a fairytale-like castle leading into quaint cobbled streets, Sirmione is one of the prettiest towns on Lake Garda. It’s a renowned spa destination, using thermal waters that have been enjoyed since Roman times, and it’s also a fantastic place to sample authentic gelato with numerous parlours serving some of the best ice cream on the lake. Torri del Benaco is a pretty resort where life centres around the colourful harbour which is dominated by the 13th century Scaliger castle and its protective medieval walls. A great base to explore Lake Garda by bus or by ferry. Lingering over lunch or watching the lights dance over the lake at night in the many bars, cafes and restaurants is part of a Lake Garda experience. There are more than 1,600 places to eat including pizzerias and gelaterias where you will be amazed by how much ice cream can be heaped onto a cone! This area covers three regions, Veneto, Trentino and Lombardy. Local specalities are varied from extra virgin olive oil, to fish from the lake such as pike, perch, whitefish and a trout native to these waters. Citrus fruits are included in many recipes and chickpea polenta, homemade pastas and sauces, risotto and venison are all regional favourites. Markets selling fresh fruit and vegetables abound and there are local cheeses such as Tombea from the mountains and Formaggella di Tremosine- a soft, medium cheese. There are many good value cafes and cantinas in the area. For those who are passionate about their food, you can drive from vineyard to vineyard or even try cookery lessons at the Ristorante Gemme di Artemesia, a hill top restaurant at Torri del Benaco. Lake Garda vineyards produce Nosiola, Cabernet and Merlot in the north. You can visit the vineyards of Bardolino where wine tastings include Bardolino Classico and Chiaretto- a pleasant light rose wine. Bardolino hosts two annual wine festivals, one in June, and the other in October which attracts a huge audience of wine enthusiasts from across the continent. It is a celebration of the harvest of the grapes from around Lake Garda from which the Bardolino classic, Chiaretto, is produced. The beautiful towns and villages around Lake Garda come with a wealth of shops to explore. From souvenirs, food delis, high end Italian fashion, leather work, toys, shoes and more there is plenty of shopping to be had where ever you are. For those with a love of vintage and antique items, there are plenty of antique and flea markets happening around Lake Garda selling a delightful variety of nick-nacks from trinkets to furniture. If you fancy visiting one of the bigger cities like Verona or Venice, there are plenty more high-end label and boutique shops to be found there, all embracing that instantly recognisable Italian style. The Sirmione Spas on the peninsula of Sirmione are amongst the top natural spa complexes in Europe. There are the two spa centres Virgilio and Catullo, and also Aquaria, a unique Thermal Wellness Centre set in a large park with thermal pools overlooking the lake. All spas have thermal pools filled with the sulfurous water containing natural minerals that flows from the depths of Lake Garda. Aquaria offer beauty and relaxation treatments and courses. Another natural thermal bath complex is the Garda Thermal Park in a spectacular setting near Cola di Lazise. Inghams offer some top hotels with their own spas in different locations, such as the Hotel Olivi Thermae & Natural Spa in Sirmione, and the Aqualux Hotel Spa & Suite in Bardolino. Archaeological sites, museums, and spectacular medieval castles and forts dating from the 12th century form the rich tapestry of Lake Garda’s history. It seems like there is no end to the summer festivities on Lake Garda! Fireworks and festivals, sailing regattas, a chess festival, music and film festivals, and even a medieval festival with Renaissance pageantry, jousting and knights in armour. The Garda Jazz festival takes place in June and the Musica Riva festival, a competition for young musicians, is in July/August. The Notte di San Lorenzo in Bardolino in August is a night of shooting stars celebrated by towns around the lake. Fish festivals take place in Malcesine and Desenzano. FREE EXCURSION | Pre-book 3 excursions per person and receive a FREE full day excursion to Verona* (saving up to £37). Not many people come back from holiday and proudly exclaim that they spent a night at the opera! 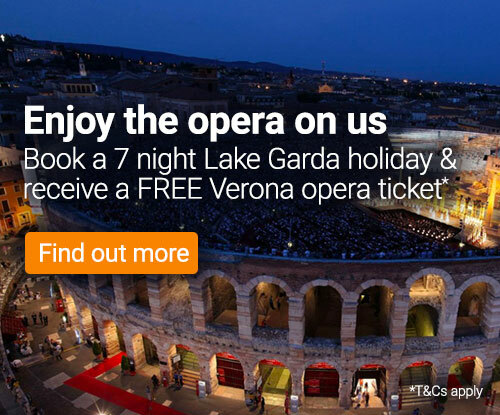 A truly classic and luxurious experience, the Verona Opera is internationally famous. Visiting the Verona Opera for an evening with Inghams is a must, and you can view our full programme of upcoming excursions on our Verona Opera page. Transport to and from Verona is included in the price of your opera ticket. It was famed writer Truman Capote who described Venice as 'like one is eating a box of chocolate liqueurs in one go' and quite rightly. A day in this rich and indulgent city known for its spectacular Renaissance architecture, dramatic theatre history, cobbled streets and charming waterways is not to be missed. The Venice Classic excursion allows you to explore the city with a guide as well as at your own pace. With coach and water taxi transfers, an enchanting gondola ride as well as time to take in sights of the Basilica, Doge's Palace, St Mark's square and the Rialto bridge in your own time, this is the perfect introduction to one of Italy's most magical cities. An extension of the Venice Classic excursion, this day exploring the cobbled lanes and quaint waterways of Venezia includes a lagoon boat trip of approximately one hour during which you can see the Laguna islands as well as other famous spots and monuments. With Venice having been the setting for so many works of theatre and literature, there is so much to see and with your departure time back to your hotel not until 9 pm, you won't be rushed to fit them all in. The Dolomites have long since been considered the most breath-taking part of the Alps and this excursion gives you the chance to embrace the mountain life with one of our fantastic tour guides. Starting with a scenic drive through the exceptional South Tyrol, Val di Fiemme, Cavalese and Moena regions, you will then stop off at Passa Pordoi and take in the incredible views from this 2,000m high vantage point. You can then explore the terrain at your own pace either by taking one of the trekking paths or simply enjoying an Aperol at a Refugio and taking in the views. A stop off at the chocolate box town of Ortisei is included en route back to your hotel as well as plenty of stops for photo opportunities in this awe inspiring landscape. Discover the breathtaking natural beauty of Lake Garda, the contrasts of the lake, the picturesque surrounding towns, villages and their villas, as well as the spectacular mountain scenery of the north and the sunny plains of the south. Travelling by both coach and ferry, the tour itinerary for this excursion varies depending on where you start but will usually follow the famous Gardensana road lined with fragrant olive and lemon trees to reach the likes of Malcesine, Sirmione, Salo and Limone. Verona is one of Italy’s most charming Città d’Arte. This day trip dips into the romance of this medieval city, reliving the scenes from Romeo and Juliet while wandering around through the cobbled streets and past ancient buildings. The impressive 2,000 year old Roman arena is one of the best preserved Roman amphitheatres in the world and is currently home to the Verona Opera, and the marble paved shopping street of Via Mazzini leads you to the stunning Piazza Delle Erbe. The handsome city mixes its rich past and modern present with great style. One of the most stunning cities in Italy, Milan has transformed what comes to mind when we think of the industrial landscape. This hive of activity and industry plays host to the heavyweights of haute couture fashion, art and baroque architecture. From the towering and awe inspiring Duomo to Da Vinci's Last Supper housed in the Santa Maria delle Grazie, a guided tour of Milan is to be missed.